IT COULD BE five years from now before a public vote on introducing a directly-elected mayor in Dublin is held. The proposal was initially shot down in March, after Fingal County Council voted against it. The three other councils in the capital – Dublin City, Dún Laoghaire-Rathdown, and South Dublin – were in favour of the move. On Monday, Environment Minister Phil Hogan held talks with mayors from the four councils in a bid to resuscitate the idea. Mags Murray, the mayor of Fingal County Council, said that any plebiscite on the issue is at least two years away. She noted that the idea of coinciding any vote for a directly-elected mayor with the 2019 local and European elections was discussed at the meeting. The Fianna Fáil Councillor said that she went into this week’s meeting “expecting a presentation or a report, but none were forthcoming”. The minister is kicking it back to the four Dublin councils, he is looking for proposals from us. Murray told TheJournal.ie that the councils were asked to provide submissions on the issue by the end of October as most of them have met for July and will be focused on budgets come September. In one sense it’s hard to see the urgency of it … considering there’s such a long lead-in time. Murray added that introducing a directly-elected mayor was “fairly unwieldy” as it would require “changing structures within local authorities”. She stated that the new mayor would have “far-reaching powers and functions” and expressed her misgivings about them having the scope to elect “a Cabinet-type administration”, saying that this “set off alarm bells”. If the whole thing is to go ahead – electing one person and giving one person the power to pick their own Cabinet – I don’t see the accountability in that. Murray said that Fingal voted against the plebiscite in March “from the point of view that there wasn’t sufficient information provided on it”. Fintan Warfield, the mayor of South Dublin, described himself as a “big supporter” of the motion. Warfield said that Hogan was “facilitating a discussion rather than bringing any proposals to the table”. He noted that the Minister will not be moving forward without getting all four councils on board. The appetite seems to be there from the Government, but they don’t want a top-down approach … The appetite is there from the Department, but they want to get the councils on board. 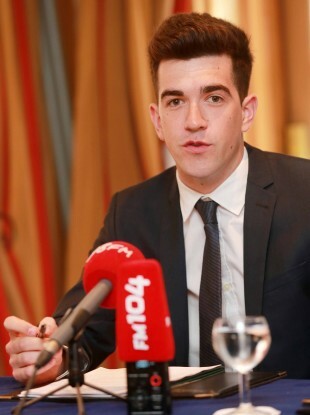 The Sinn Féin Councillor added that Hogan was “anxious” to organise another meeting between the mayors, regardless of whether he is or isn’t the Environment Minister after the Government reshuffle. Warfield admitted that he was “disappointed” at the slowness of bringing about this “much-needed reform of local government”. Dublin City mayor Christy Burke and Marie Baker, mayor of Dún Laoghaire-Rathdown County Council, did not respond to requests for comments on the issue yesterday. Meanwhile, the Green Party has called for the plebiscite to be held on the same day as the marriage equality referendum next year. Party leader Eamon Ryan said that the Government needed to act on the issue. “Given the groundswell of public and civil society support for this initiative, it’s time for Fine Gael and Labour to stop blocking the move towards a more democratic system of government for Dublin and give the people a chance to have their say. One only need look at the deluge of problems facing Dublin over social housing and homelessness, property tax, licensing regulations, transport and waste to see that someone with a democratic mandate needs to take charge. “I’m particularly disappointed by the silence from the Labour Party on this issue and the failure of their councillors in Fingal to support it in March. “They committed to a Directly Elected Mayor in their pre-election manifesto, yet for some reason the party leadership has been mute while Minister Hogan has attempted to wreck any progress on the issue,” Ryan said. Email “Dubliners may have to wait five years for a directly-elected mayor”. Feedback on “Dubliners may have to wait five years for a directly-elected mayor”.